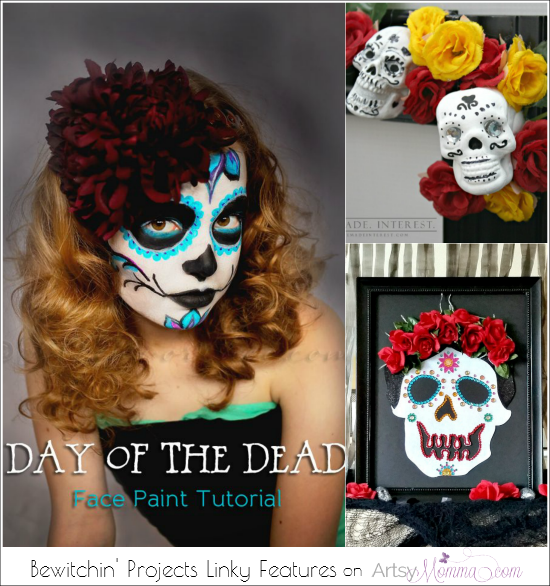 Today’s Bewitchin’ Projects Linky features are DIY Day of the Dead Sugar Skull Ideas. Dia de los Muertos is a holiday celebrated in Mexico that honors those who have died and celebrates their memories. Many will decorate the gravestones with sugar skulls and marigolds. It is a 2-day celebration. 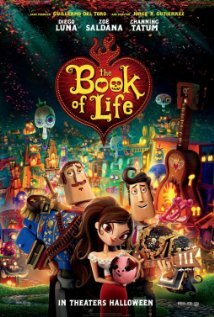 We recently saw the movie The Book of Life and I thought it was cute. My kids loved it as well. My hubby is Mexican so I am always looking for ways to teach them about their Papa’s culture. This movie touches on the Day of the Dead. Parts of the movie take place in vibrantly colored The Land of the Remembered where kids can see the designs on the character’s faces. The movie is about 2 friends who want to marry the same girl (a childhood friend) and the leaders of the underworld place a bet on who will marry the girl. One dies because of the sneaky ways of the leader of The Land of the Forgotten, and the movie then takes you on his journey back to his one true love on the Day of the Dead. I definitely recommend it! My friend took her kids to see it last week and she updated her Facebook status that she thought it was corny, but then was crying by the end and updated that she thought it was cute. Thanks so much for the great link-up and for featuring my project. Thank you so much for sharing my face paint tutorial. You made my day!